Jazz up your fruit platter with colourful fruits cut into fun shapes (e.g. cubes, strips, stars, apple slinkies). Serve with yoghurt, cheese cubes or cream cheese. 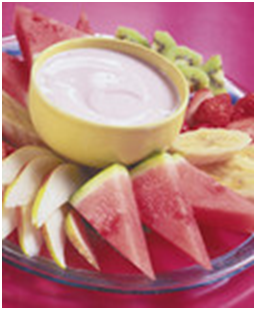 Mix brightly coloured fruit in colourful plastic bowls and serve. Freeze any leftovers and serve as a delicious frozen snack on a warm day. Mix dried fruit in colourful bags, add cherry tomatoes and chopped cheese slices – a great idea for an outdoor picnic. 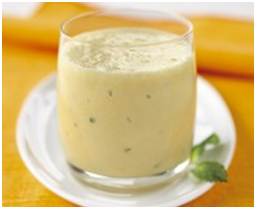 Mix fresh or frozen fruit in a blender with milk and yoghurt. You can use any fresh seasonal fruit or leftover fruit from the fridge or freezer. Serve with yoghurt or cream cheese. 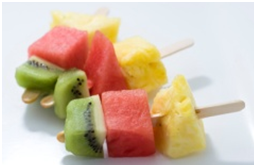 Chop colourful fresh fruit and serve in plain cones. Thread kiwifruit, watermelon and pineapple pieces onto icy pole sticks to make colourful patterns. Use your choice of fruit to make a healthy crumble. Try apples, peaches, pears and apricots served with custard or yoghurt. Place peeled pear halves into an ovenproof dish, pour some 100% fruit juice over them and bake until tender (approximately 25 minutes). Serve with fruit muesli and a dollop of yoghurt. Place sliced banana, pineapple and strawberries in a small plastic cup and cover with 100% fruit juice. Place paddle pop sticks in the middle of each cup and freeze to make icy poles. Make a cool treat by blending fruit with ice and a little water. Chop fresh fruit (e.g. peeled orange or mandarin segments, grapes, bananas), wrap in plastic wrap, then freeze and serve on a warm day. 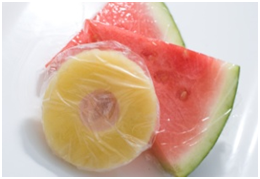 Drain tinned pineapple rings, wrap in plastic wrap and freeze before serving. Wrap sliced watermelon wedges in plastic wrap and freeze before serving. 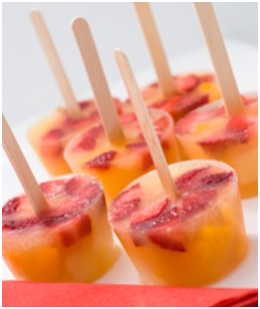 Thread hulled strawberries onto paddle pop sticks and serve fresh or frozen. 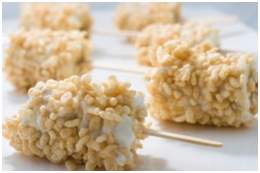 Thread peeled banana chunks onto paddle pop sticks, dip in yoghurt or custard and roll in rice bubbles. Serve fresh or frozen.